I’m always envious of those Martha Stewart types who seem to have it all together. You know, nice home, nice garden, nice kids, good food on the table, nice table settings. And I’ve always suspected that while Martha Stewart herself has a huge operational team to make that happen for her, there really exist real women and men out there who live the life she has trademarked. Such people can get up in the morning, put the coffee on, make the bed, groom themselves, get breakfast ready, get the kids ready, yadda-yadda-ya… And that’s just within one hour in the morning. On the best of mornings (and only weekend ones at that), I just about manage to get out of bed some time after 1000h, stumble to the shower, waste copious amounts of water to get my eyes open, and demand breakfast very loudly until P gets up and makes it. But today, for some odd and unknown reason, I made muffins. Banana and blueberry ones at that. I’ve never made muffins. Not successfully anyway. I can make the most intricate of damn sachertortes, but hand me a muffin tin and crap comes out. Figuratively. Please, what do you think I am? Cack-handed? Recipe courtesy of Epicurious.com. Not having a Martha Stewart team of organised people to ensure all reagents were in place prior to baking, I was about 2 bananas short of a full cup and completely lacking oat bran. But I had frozen blueberries. That counts for something. Substituting oat bran with some weird New-Age seven-grain hot breakfast mix seemed to work, with the pleasant side-effect of crunchy, nutty bits without the sat fats of nuts. But substituting a shortfall of bananas with milk, vanilla and maple syrup results in an overly moist muffin lacking structure. No matter. P liked it. While not a success, it wasn’t a complete failure. Eww. I’ve just looked at this post on Firefox and my muffins look like crap. They looked OK on iPhoto and Safari. What’s up with that? 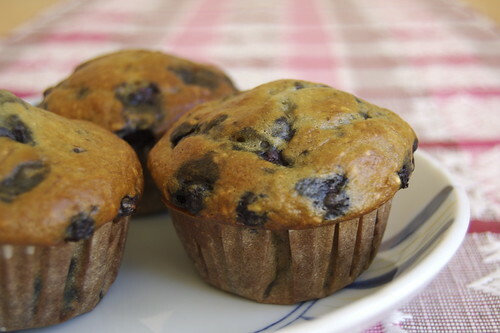 This entry was posted in akatsuki eats and tagged baking, brekkie, muffins. Bookmark the permalink.